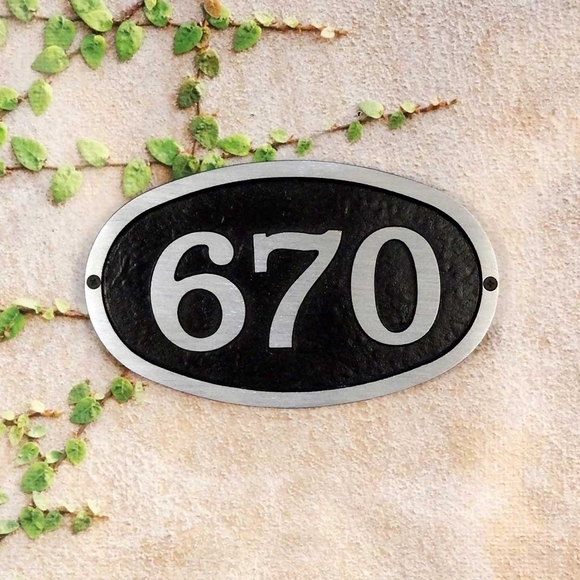 Oval House Number Plaque - - modern cast aluminum personalized address plaque with brushed aluminum numbers. Wall mount. Made in USA. Personalized address number plaque is made of cast aluminum with permanently molded brushed aluminum numbers. Holds up to three (3) 3" numbers. Two font styles: Bold Italic font (large image) and sleek Times font (small image). Color: black with stunning brushed aluminum border. Dimensions: 10.75"W x 6.5"H x 0.5".